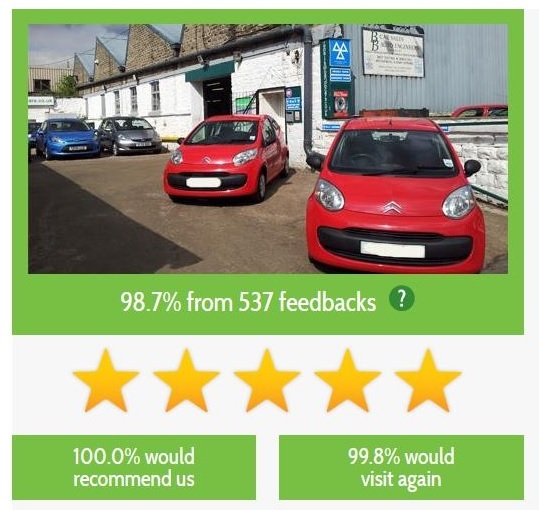 Established in 1977 and with over thirty years’ experience in the motor trade, our family run business has a reputation for quality service, customer care and commitment. Situated only 14 miles east of Manchester and within easy reach of the motorway network, getting to us should be no problem at all. Through our workshop we can offer complete vehicle maintenance, as well as MOT testing. We are experienced in maintaining a wide range of vehicles from cars to light vans and even motor caravans. See our repairs page for more details. If you want to purchase a car or light van then look no further than our current stock list, which is updated regularly. If you don’t see what you’re looking for then feel free to phone or e-mail us with your requirements. Our contact number is provided at the bottom of the page. Using our network of contacts built up over many years we feel sure we can find a vehicle to suit your needs. Correct as of November 2016. Click to see our most up to date feedback.